Never take the easy way out! In the 70s, hydro hulls became so narrow that a great deal of ingenuity was involved in mounting the motors. The stricter noise limits also introduced the concept of flexible mounting. To secure this OPS 29 with its lugs removed, an entirely new rear housing was made that bolted through the sides of the hull with a clamp round the nose of the crankcase, also screwed directly through the hull. 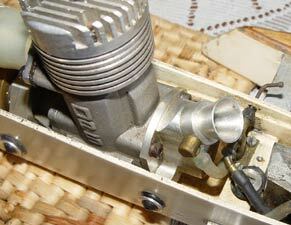 A knock on effect was that the vibration from the motor often resulted in broken needles, hence the remote set-up seen here. 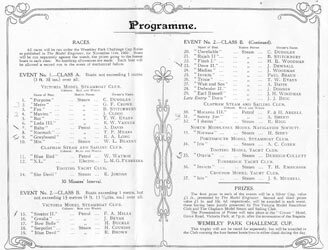 This programme is from a regatta at Victoria Park in October 1910 during which the Wembley Park Challenge Cup would be raced for. Eight clubs were represented and notable entries included Ted Vanner, Arkell Brothers, 'Carpenter's Mate' W Blaney and F A Mills the Stentor engine builder. 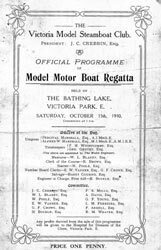 Steam, electric and petrol powered boats competed under the watchful eyes of the Marshall brothers and 'Uncle' Jim Crebbin. 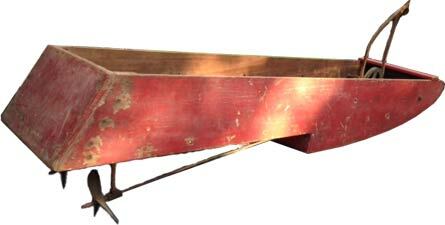 We have known about this boat for a while and it is believed to have come originally from Len Gates, one of Ted Vanner's fellow Victoria members. 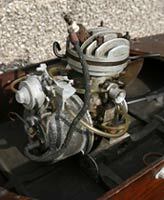 The motor is a mystery, although another has appeared very recently and the distinctive designs leads us to believe that they were based on commercial castings. 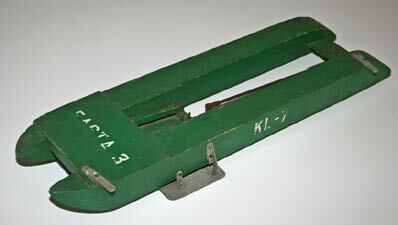 Unlike Ted's usual engines, this was designed for vertical mounting, yet was mounted horizontally. The name provides an instant identification, but initially who we thought might be the builder did not tie up with any of the previous known owners. We found two original photos of the boat, and then after a search a captioned version in Model Engineer. It was W H T 'Harry' Meageen's boat. Meageen was highly successful in another sport before he took to tethered hydroplanes, firstly at Fleetwood in the 1930s and later at Altrincham. Samuel is unusual in having what was variously described as an 'unorthodox' and 'fearsome' two-stroke motor, much of it inspired by Andrew Rankine. Both Meageen and Samuel have sufficiently fascinating backgrounds to warrant a 'Pitbox Special' later in the year. 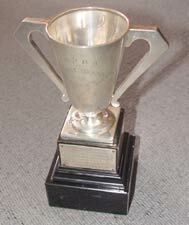 The engraving on this trophy found in Nuneaton says it all. 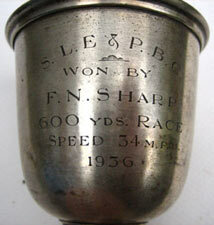 Sharp was an engineer from Wandsworth in London and responsible for the design of a range of four-stroke hydro motors sold by various companies as outlined in our earlier article. 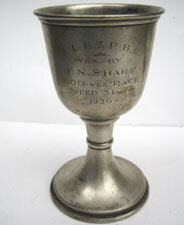 He was also a regular competitor from 1908 and entrant in the ME Speedboat Competition. 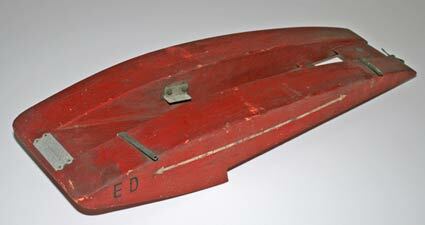 Unfortunately, one of his winning boats was stolen in the early 30s. 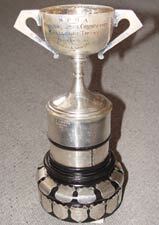 This cup was won at Brockwell Park towards the end of a very long career . Another mystery from King's Lynn having had the same owner as the Challenger, and one assumes the third in the Fasta series? Numerous people were experimenting with the twin hull concept, but this one is unusual in having aluminium planing shoes rather than steps or sponsons. The entire front half and engine bay are sheeted in, similar to the Challenger, presumably to provide more lift for the very small motors being used. This original example of the ED Challenger ties in nicely with the George Stone articles as its design was taken directly from George's Lady Babs. 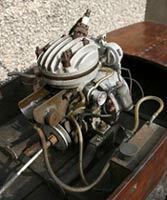 Marketed from 1949 and intended for the ED 2cc MkII it was said to be capable of 40mph and as fast as any C class boat with a full sized engine. This example is called 'Speed Queen' and came from the King's Lynn Club, although at present we are unable to establish who the original owner was despite a registration number.